Throughout 2018, rents for shops and offices slowly declined. The real estate agency RAMCO estimates that, in just a few months, they dropped 10 to 15 percent. Hamra is still one of Beirut’s busiest commercial streets, but the area is now feeling the effects of Lebanon’s current economic downturn. As a sign of the difficult times, the cost of leasing a shop and office has gone down 10 to 15 percent in recent months. Currently, there are about 4,000-square-meters of commercial space available for rent on Hamra Street, or the equivalent of around 10 stores. Some of the biggest spaces, at more than 500 square-meters, have been empty for several years. As a consequence, the rent for a 600 square-meter space has dropped from $300,000 to $250,000 in the past year, or from $500 per square meter to just over $400. The falling prices aren’t restricted to Hamra Street. Malls and other commercial destinations have also seen a similar decline. Empty storefronts commercial spaces on either end of Hamra Street are the least desirable, and around 70 percent of them don’t have tenants. The owners of these spaces don’t appear to have adjusted their asking prices, so the costs are out of step with the market. The best locations on Hamra Street are estimated to go for $600 to $900 per square meter per year. Sites located at the beginning and end of the street, it stands to reason, shouldn’t be priced at over $500 per square meter per year. The downturn in rent prices follows a change in the types of brands present on the street. For a number of years, big shops selling cheap products, such as Akil Bros, Eldorado, Max and LC Waikiki, have taken over the street. International brands, such as Jack & Jones, Nike and Adidas, have become a minority. The British franchise Costa Coffee was also replaced by Rossa, a local cafe, and Shawarma vendors and shisha cafes have blossomed. Dried fruit and nut vendors are the latest trend to have popped up. Four shops opened in only a few months. Limited demand Hamra hasn’t been an in demand business destination in Beirut for several years now. Fewer companies and individuals want to base their businesses there while the number of available spaces has continued to grow. Only two construction sites on the street are for residential properties, while others are for commercial space. Promoters and developers are now shunning Hamra Street as a destination for business projects as its reputation as a commercial center has suffered. The street itself is difficult to access, there is a lack of parking and the available office space is often dilapidated. Aside from one or two well maintained buildings, the stock of open office spaces is antiquated and located in low-end building with deteriorating facades and entrances. Many of the buildings are owned by foreigners who have neglected to care for the properties. All of these factors have combined to create a downward spiral. Weak demand has discouraged owners from starting renovation projects. The decline in reputation has resulted in lower rents, with lower end spaces priced at around $125 per square meter per year. Many offices of 70 to 80-square-meters are available for around $11,000 per year, or just over $900 per month. 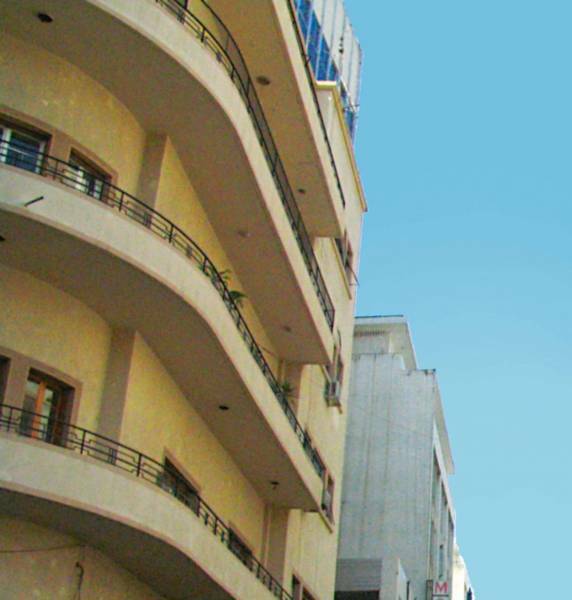 These spaces in Hamra can’t compete with well maintained properties such as Gefinor Center in nearby Ain el-Mreisseh, where rents are around $175 to $200 per square meter per year.